Growing up, my dad always used to make Chilli for our family when we went skiing in Maine. Loaded with vegetables and protein, it’s the perfect way to warm up on a cold winter night. When I was little, my sisters and I would beg my dad not to put beans in the Chilli– back then I was a very picky eater and beans were definitely on the no-go list. Since then, my taste buds have evolved and now Chilli doesn’t seem complete unless there are a couple cans of beans in it! 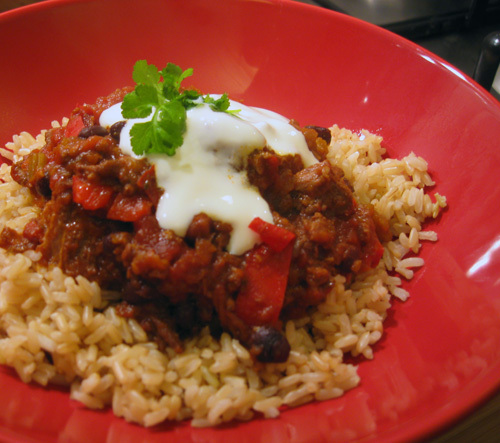 This recipe is incredibly versatile – the beauty of Chilli is that it is not an exact science, so don’t worry if you don’t have every ingredient. Do you agree with 8-year-old me and hate beans? Then leave them out! Can’t find brisket at the store? Substitute it by adding in more ground beef (though, brisket does make the Chilli more interesting, so do give it a try if you can find it). Want to make it vegetarian? Then throw in some extra beans or use soy “ground beef” instead of the meat. Tweak the amount of hot peppers according to your tastebuds; my advice is to start conservatively – you can always add more later, but it’s hard to make the dish less spicy once you have gone too far! (…Like the time that I threw in an extra scotch bonnet and figured that it wouldn’t make that much of a difference since it was de-seeded. Let’s just say I was wrong). Even though it is common sense – just a little reminder to wash your hands thoroughly after handling the hot peppers. Also, make sure all the seeds get thrown in the garbage so your pets don’t eat any that happen to fall on the floor! Add a few lugs of olive oil to a large pot and heat on low. Throw in the onion, celery, carrots, ground beef, cumin, paprika, oregano and bay leaves, and fry gently for 10 minutes, until the onions have softened. While this is happening, trim the fat off of the brisket, and cut it into 1 inch chunks. 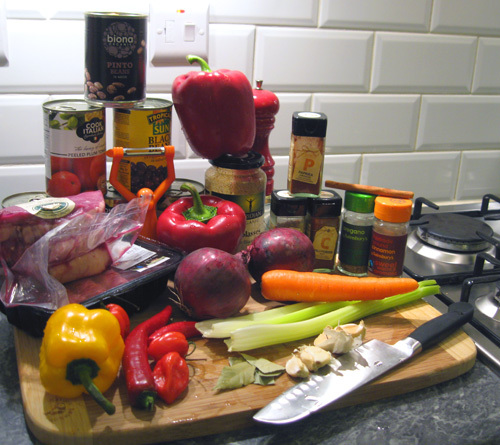 Add 1 of the diced chillies (and half a scotch bonnet if you are brave!) to the mixture in the pot, along with the coffee, tinned tomatoes, and molasses; add the pieces of brisket, then season with salt and pepper and give it all a good stir. Put the lid on the pot and let it simmer for approximately 3 hours, making sure to stir occasionally. 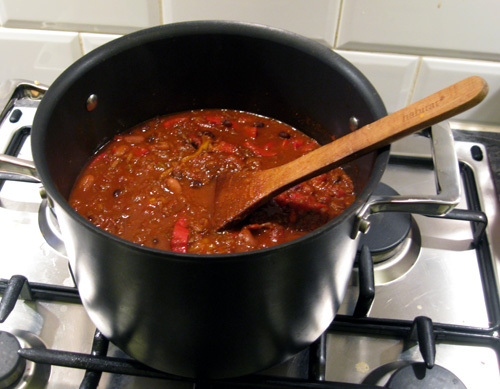 After the chilli has had time to simmer for a few hours, have a little taste to judge the spiciness of the chilli; if you think it needs more of a kick, add in a little more de-seeded chilli or scotch bonnet. By this time, the brisket should be falling apart, but help it along by using two forks to pull it apart. Fish out the cinnamon stick and the bay leaves, and you are good to go! 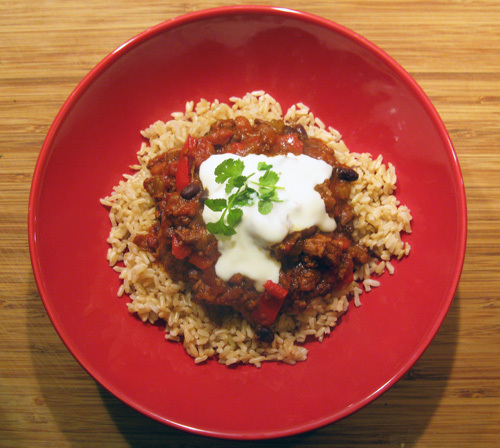 Serve the Chilli on a bed of brown rice and garnish with a large dollop of yogurt and a few sprigs of some fresh coriander.